Only 5 indulgences per week. Sleep at least 6 hours per night. Three training sessions weekly (I had already been doing this, so not a change, but a goal to continue it). Walk to work three times per week (just over 15 minutes each way). Take BCAAs (Branched Chain Amino Acids) with each training sesion. That’s it. Five things. Well actually there was a 6th: I submitted an online compliance form each day. The form consists of 10 questions, most of which are multiple choice, so takes less than a minute each day. So how’d I do? Perfection on the five indulgences. Which I find amazing, given that I had to endure Christmas party season. I faltered a bit on the sleep, which is pretty bad considering I set the bar pretty low. I’ll do better on this one when I re-start in January. I was perfect for weeks 3 and 4, 6 of 7 one week, and an abysmal 4 of 7 the second week. Failed at the walk to work on week 1, but was perfect the following 3 weeks. Near-perfect on submitting the online compliance form – I only missed one day out of the 4 weeks. 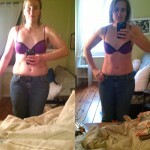 I lost 3.5% body fat and almost 8 cm (3 inches) from my waist and hips. This was actually over the first 3 weeks, as I had no losses in the last week, which I think is largely because I took the body tape measurement and photos 2 days before my period started, so I was a bit bloated. Well I guess if I can show them to some random guy at the top of Mt Tremblant, I can show them to the internet. I’m quite pleased with the result. It’s not “How to lose 10 pounds in 2 weeks, the easy way“. But that’s not the point. 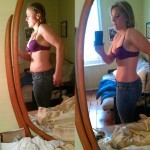 The quick fix is rarely the answer in life, and it’s definitely not the answer in weight loss. After all, it’s not really about weight loss; it’s about changing behaviours, with a fringe benefit of weight loss. That’s what keeps the four or eight week results intact a year from now. I’m also pleased with how easy it was. That’s the part of the program I’m really proud of. In my case, I’m a snacker who loves food, so I had to address eating in a manner that wouldn’t make me rebel. For me, the online reporting was huge. I managed to beat quite a few cravings because I knew I had to report how I did, and I didn’t want to report that I had missed the mark. Keeping my goals in mind was also very effective for me, and was the source of a few craving victories. I did have some falters – I didn’t get as much sleep as I should. But I did much better over that 4 weeks than I normally do, or than I would have if I hadn’t been focusing on it and keeping track. And sleep matters when it comes to weight loss! Or so says all the research. The cool thing is that I’ve been largely sticking to most of these principles since stopping last week. I am allowing myself more indulgences, but it’s Christmas, and I want to. Also, I’ve been visiting with my brother and my sister-in-law and they keep a lot of very tempting junk food in the house. Think you can do better than I did?